While our first passion is rose gardening, our second is travel. Paris is the French at their very best, where they meld form and function into art in their architecture, fashion, food and gardens. Travel with us down the boulevards and backstreets and discover this magnificent City of Lights. We enjoy sharing our knowledge and experience about rose gardening by offering unique programs for your group or organization. We present PowerPoint programs and lectures at garden clubs, flower shows, conventions, symposiums, garden centers, nurseries and private businesses as well as seminars for Master Gardeners, classes for adult education and workshops to the general public. 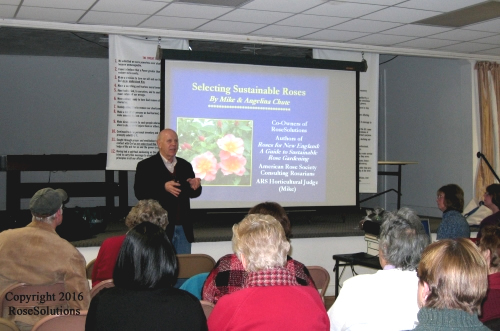 No matter how large or small your group, you’ll learn everything you need to know about growing and caring for roses through our informative and entertaining presentations. All programs are 50-minutes long unless otherwise noted and include time for questions and answers. 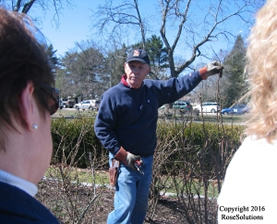 Hands-on workshops on planting and pruning are also available. I cannot thank you enough for such a wonderful program last evening. It was the perfect choice for our group and very informative. Mike, I liked your sense of humor and how you incorporated it into your talk. Our members enjoyed every minute. We heard so many positive comments and feedback afterward. Two guests that came to hear the presentation joined our club!!! I hope both of you have a healthy Winter and look forward to seeing you at Wine and Roses June 17th. Most of all I thank you both for your patience and help making it all possible. 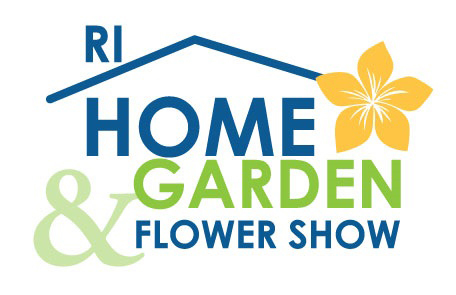 I go to the Rhode Island Flower Show every year on the day you’re presenting just to catch your lecture. Your programs are varied and informative as well as entertaining and your command of rose horticulture is amazing. Plus I’ve never seen another garden speaker connect with the audience like you do. I look forward to seeing you once again next season. It has been our pleasure to have you as guests. You always make the presentation so informative, easily understood and fun. AND it still amazes me how you remember names of people in the audience. You must make mental notes from the time you arrive until you are through the presentation. Again we all enjoyed your fun and informative presentation on the Fall care of roses. I always learn something new when I hear you speak and the club feels the same way. My Cherry Parfait specimen now blooming on my kitchen table is gorgeous and the foliage is utterly pristine, evidence your methods really work. I hope you and Angie enjoy your travels and new interests. Holland in the Spring should be delightful. We thank you so much! It was a wonderful program. You are both great speakers. Everyone enjoyed it thoroughly. I know one of our members has recommended your program to another Garden Club. Best wishes for a productive and healthy summer! The members truly enjoyed your program. They stayed to the end because you made it so interesting and answered their questions. I had many members approach me later and say this was one of the best programs ever. You actually have some members now feeling brave enough to plant “the right rose in the right spot." Appreciative comments about your program (and congratulations to me for choosing you) continue to come in personally and via email, and I am well-pleased. As I mentioned yesterday, I will submit the speaker evaluation form to the Garden Club Federation of Massachusetts and also record the club’s positive response in the program chair’s handbook for future chairs. Take care and thanks again. I look forward to reading your book. I'm sorry it's taken me so long to write and tell you how much the QGC enjoyed your rose presentation on July 14 in Jamestown. The Garden Club had their August Board meeting last week and, although I knew how much I'd enjoyed and learned from the presentation, I didn't actually know how very well received it had been by the entire club, and by the public. We've had some very positive feedback, so thank you very much for spending your evening with us and sharing your valuable knowledge. Thanks again for sharing your joy of roses with our garden club. Hopefully Jamestown's roses will be the beneficiaries. Thanks Mike, I enjoyed your program very much--just the right blend of knowledge, practical information and fun. I hear nice comments from participants as well. Thank YOU! It was a great presentation, and I now feel confident to tackle roses this year. I, also, like white ones. On behalf of the Winchester Home and Garden Club, we want to thank you for the terrific program yesterday. It was the best this year, and we've had some good ones. Thank you for your excellent presentation. It's not often that expertise is so well complemented with high level speaking ability. You played with the audience and they loved it!! I'm so very glad that you were able to come. Every one was very impressed and enjoyed themselves thoroughly!! You were a bit hit!! From Boulevard Montparnasse to the River Seine, from the Eiffel tower to Notre Dame Cathedral, the city of Paris is the epicenter of European culture. Join á la carte travelers Mike and Angelina Chute as they visit iconic museums -- the Louvre, the Orsay, and the Rodin. Dine with them in elegant French restaurants as well as cozy, intimate neighborhood bistros and inexpensive but delicious creperies. Wander through the famous Luxembourg gardens, stroll through stunning rose gardens and take leisurely walks along the Seine. Meander down the small, winding streets in the bohemian art colony in Montmartre, Paris’ oldest neighborhood. Explore Paris’s rich history of churches and cathedrals and see the most extraordinary collection of stained glass anywhere in the world! We will be available to sign copies of our books Roses for New England: A Guide to Sustainable Rose Gardening and Rose Gardening Season by Season: A Journal for Passionate Gardeners after the program. Roses for New England is a special presentation for every rose-lover who wants to grow hardy, healthy, and disease resistant roses in their home gardens. This program specifically addresses the merits and challenges of rose gardening in New England. Novice rose gardeners will find everything they need to know to successfully grow roses and experienced gardeners will utilize this program as a ready reference to enable them to grow better roses. Mike and Angelina Chute’s book, Roses for New England: A Guide to Sustainable Rose Gardening is the companion reference to this program. This program includes: six easy steps to growing roses in New England; how to select winter hardy and disease resistant varieties for New England gardens; the best way to plant and prune roses; and tips and personal anecdotes from the authors’ twenty-five years of rose gardening experience. Roses for New England shows you how to grow roses better than you ever thought you could. Sustainable roses are sturdy, attractive plants that can hold their own in a pesticide-free landscape. This program features modern, recently-introduced varieties as well as old favorites that are disease-resistant, winter hardy, easy to grow and bloom all season. Selecting Sustainable Roses delves into the core of sustainability, explains the different grades and types of roses, their growth habits and how to select the best varieties for your garden. We use the experience gained in our own sustainable rose garden as a practical model. (We also include lots of tips on basic rose gardening.) You’ll be amazed at the wide choices of color, size and fragrance that are available and will fit into any New England garden. This presentation covers the history of English roses as well as the unique David Austin breeding program that focuses on hybridizing healthy, fragrant roses with superior flower form. David Austin’s English Roses for New England Gardens is a collaboration between David Austin Roses and Mike & Angelina Chute and includes old favorites as well as new introductions plus a list of varieties that are known to grow well in New England gardens. David Austin, a nurseryman from Shropshire England, combined the charm and fragrance of old garden roses with the vibrant color and remondancy (repeat bloom) of modern roses. He called these remarkable plants “English Roses” and they are now grown all over the world. Creating an Easy-Care Rose Garden explains how to build a beautiful as well as sustainable rose garden from scratch. This PowerPoint program provides a practical blueprint for anyone who wants to create a rose garden, beginning with suggestions for rose garden design. It includes everything from the value of water and nutrients; proper soil for rose cultivation; rose bed construction; the all-important selection of vigorous, disease resistant varieties as well as suggestions for hardscape and companion plants. The program is modeled on our rose gardens and includes tips and anecdotes from our twenty years of rose gardening experience. This program showcases twenty-five exceptional roses including new introductions as well as a few old favorites. From soaring climbers to petite floribundas, it features long stemmed beauties, lush sprays and attractive landscape roses – the best roses we have ever grown. Twenty-five Fabulous Rosesdescribes every variety in detail, explaining why each is a great garden rose. Timing is everything and in this unique program you will learn how to grow beautiful roses by letting nature – and your roses – show you the way. Rose gardening, like all gardening, is influenced by seasonal rhythms, from the first stirrings of early spring to end-of-season tasks. As gardeners we follow these comfortable seasonal routines that enhance our gardening experience. This PowerPoint program, inspired by our second book, Rose Gardening Season by Season: A Journal for Passionate Gardeners, divides rose care into seasons and provides a blueprint on what roses need and a time-table of when they need it. Allowing nature to be your guide will enrich your enjoyment of growing roses and add flavor to every gardening season. This program introduces 12 easy-care sustainable roses beyond Knockouts that any gardener can grow at home. In addition to this “Gardener’s Dozen” of winter-hardy, disease resistant and attractive rose varieties, the presentation includes tips and advice from Mike and Angelina’s two decades of rose gardening experience. Learn the best way to plant, prune and grow and get the rose garden you have always wanted. We provide the laptop and digital projector for all PowerPoint programs. You provide the screen and a table for the lap top.